MGM Dizzee World Chennai - MGM Dizzee World is one of the finest Amusement Parks in theIndia, located near the Muttukadu region in the outside of the Chennai. MGM Dizzee World is famous for it’s eautiful lawns dotted with colorful flowers and a beach covered with coconut trees. 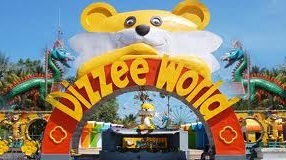 Dizzee World offers more than 60 Imported and Indian Rides like Toy train, the giant wheel, roller coaster and Dizzee Shake 100 feet. MGM Dizzee World has a lot of water related rides like Water Fall, Zipdip, Storm, Chinna Kutrallam, Wave Pool, Water Play Station etc.